It's great to see the Sputnik clone of Michael AA1TJ, on page 30, in the new SPRAT, that arrived today. Last month I received the Russian tubes 1Ж24Б and 1П24Б to build the transmitter for the Sputnik QSO party, via Peter DL3PB. Because I don't have any experience with transmitters with tubes, I first studied the proto type transmitter of Michael AA1TJ. Further I studied the excellent info on the page of Peter DL3JIN . Cees PA0CKV and Peter PA0PJE, when I attended the anual meting of the Benelux QRP Club (BQC) in Apeldoorn . A week ago I started to build the transmitter for the Sputnik QSO Party. I progress slowly, because I am tired quickly. I also have to build a power supply. 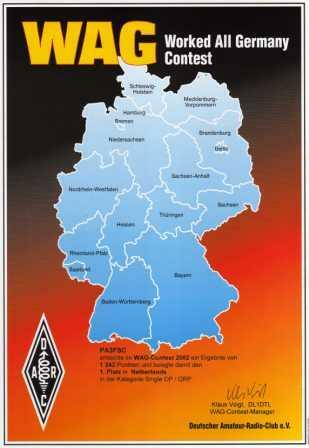 I still hope to be ready at the 4th of Oktober for the Sputnik QSO Party. In June 2011 I participated in the IARU HF World Championship. As you remember, I made two entries in my Blog about this contest. Probably I was so busy with the Blog and the preparations for the holiday, that I did not send in my Cabrilllo file. When I found out, I sent the file today. The robot gave the usual information about all the categories. The robot even kindly thanked my for participation and for submitting the log and even pointed out an ignored line. But what ever. I had great fun in the IARU HF. In a long time, I made a QSO with 8 mW. Click here to read. And made many QSO with the Lowest Possibe Power and a number of more than 1000 Miles per Watt QSO's. Click here to read. I wonder if my log will be marked as check log or will be just simply ignored. Ik had al een tijdje niet meer in mijn eQSL inbox voor mijn vorige call gekeken. Er zaten een flink aantal eQSL's voor de OQRP-contest in. In deze contest doe ik vaak mee met mijn zelfgebouwde 7 MHz QRPp Transceiver met een vermogen van 500 mW. Dat is dus VLP. Er zat ook een kaart in voor een 50 mW QSO met Wolf DL6JZ. 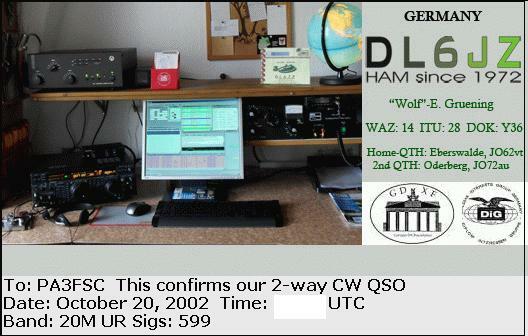 Het QSO is gemaakt in WAG contest in 2002. Met een afstand va 369 mijl is dit QSO goed voor 7377 Mijl/Watt. Het kan soms vreemd lopen. Want met slechts 23 QSO's met 500mW (4), 50 mW (18) en 25 mW (1) bereikte ik de eerste plaats voor Nederland met QRP en ontving een prachtig Award. I participated in the YO DX HF contest. The nice thing about a DX contest is that everyone can work with everyone, generating a lot of activity, so many QSO's can be made. I used the Lowest Possible Power in each QSO. I adjust the power before I answer a CQ. The higher the S-meter reading, the lower the power can be. I used a power of 80 mW to 2.7 W into an Inverted Vee. Nearly all QSO's are made within Europe. Outside of Europe I made a QSO's with Bud AA3B. I was suprised that it could be made with just 360 mW. Bud's station has Excellent Ears. The second QSO outside Europa was Mongolia (JT), with 1,8 W.
This tabel shows the DXCC countries and the used power. All QSO's with 360 mW or less and the 3 QSO's with 800 mW with YO, are more than 1000 MPW QSO's, Considering the distance from my QTH to each of the DXCC countries. But that is not all. The QSO with JT over a distance of 4128 miles with a power of 1.8 W is good for 2293 Miles per Watt. Wow. Over the years I developed a strong "more than 1000 Miles per Watt" awareness. I have made a list of DXCC countries, with the distance to their nearest border, from my QTH. Whit the list at hand, I can look up the distance to that DXCC country, to adjust the power accordingly. For exaple, the distance from here to to Romania is 800 miles. So every QSO with 800 mW (or less) to Romania will be a QSO with more than 1000 Miles per Watt. 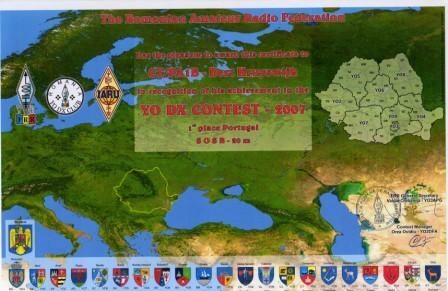 When we were on holiday in Portugal in 2007, I participated in the YO DX HF contest. I made 80 QSO's from the balcony of the hotelroom.